Did you vote for any of the Choc Lit authors in the Big Red Read? If so, thank you! 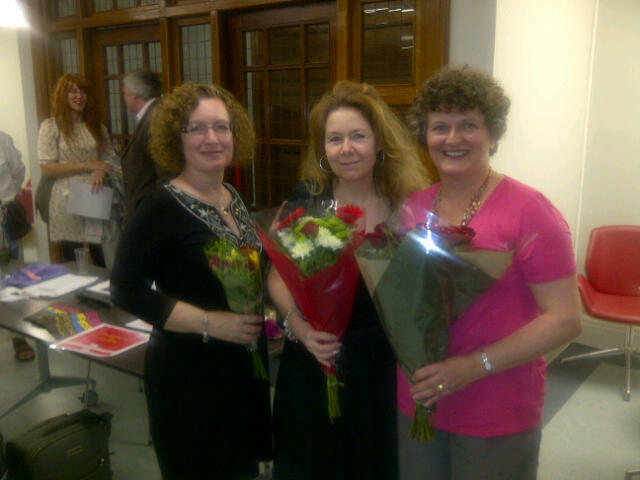 Juliet Archer won overall and I was a runner-up, Christina Courtenay won the Historical category. Here we are, clutching our flowers. Thanks to Redbridge Libraries for the Big Red Read initiative. We had a great evening at Gants Hill Library on Tuesday 4th October. Margaret James, Paul Vlito, Self, Kate Johnson, Juliet Archer, Christina Courtenay. This was just before we began - we didn't ignore the audience and talk amongst ourselves! The week before, Juliet, Christina and I, plus Kate Johnson and Margaret James, appeared at the Appleseed Bookshop at Guildford University, talking to students and readers about publishing, books, heroes, heroines, and anything else we could think of. The panel was ably chaired by Paul Vlito, author and tutor. Great to meet so many readers, especially Rachel, from the Choc Lit tasting panel. Finally, someone’s reminded me that I’d promised to report back on my new iPad2 case. You can find it here. It’s called a microshell from gearzap.com and I really like it. It’s sturdy, though not light, and when you open the cover, the iPad wakes up (a bit like the light coming on in the fridge when you open it). If you have the iPad landscape-wise, you can fold the cover back and use it as a stand, which was really useful on the train. You’re supposed to be able to do it at two angles, but I failed to make it work at the steeper angle. The iPad just slid out. I have a lot of confidence in this case as in terms of protection and safety. Definitely value for money. I got an iPad 2 screen protector, too, as I found I couldn’t read ANYTHING on the screen in the sun. The screen protector makes the iPad usable in the sunshine, but I found it a bit squinty. I like the feel of it when I touch the screen, though – it’s kind of silky. Congratulations, all! Nice flowers…. hope they lasted well. iPads are amazing aren’t they, when you first meet them – as I have recently. Ours has a very basic cover, but even so, it’s proved a necessary extra layer. Once again, congratulations all! I did vote for Want To Know A Secret? but I equally enjoyed The Scarlet Kimono. I just ordered your book and i have it in my hands. Can’t wait to read it. Yes, definitely, had made the connection. 🙂 Hope that you enjoy the book. I couldn’t wait to let you know that i found the book absolutely fantastic, I immediately wrote my review on Flipkart (the place where i order my books). I loved Honor, every bit about her. Thanks for taking me on this wonderful journey. You are a great writer and i feel proud i am your student. Thank you, Arti! I’m feeling especially pleased with Love & Freedom, today, because it won the Best Romantic Read Award at the Festival of Romance, last night!